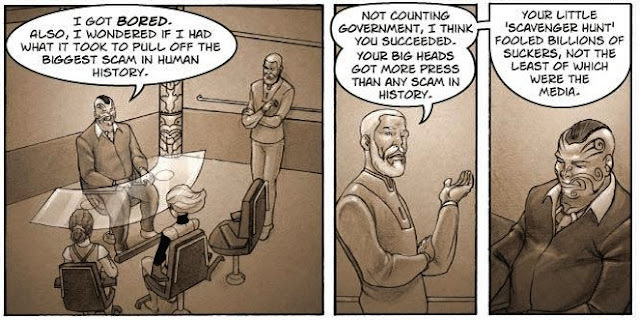 For the past several months, I've been spotlighting speculative fiction webcomics over at io9. 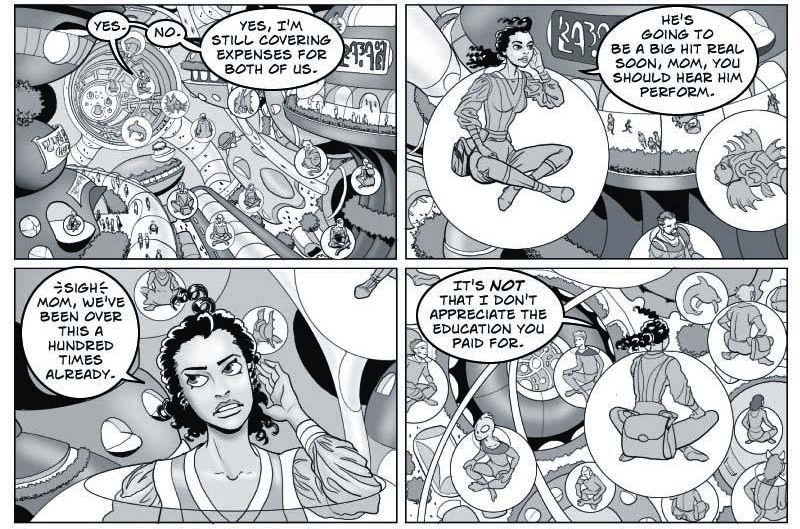 The genre limitation can be frustrating at times -- there are so many non-genre comics that I'd love to share to with io9's readers -- but it happily forces me to keep casting my webcomic net ever wider. One of the comics I came across that I might not have read otherwise was Scott Bieser's Quantum Vibe, a far-future comic about a young woman who takes a job with a surly but brilliant scientist, a job that takes her out of the stagnant familiarity of her orbital city and into the larger solar system. I like Quantum Vibe because it just feels to me like a futuristic sci-fi should: filled with visual details that give us a sense of the denizens of the future without too much explanation; packed with ideas, but not overly in love with any of them; and aware that life in the future might be radically different, but people will be the same. The commenters pointed out a couple of things about Quantum Vibe: 1) the publisher, Big Head Press, is a libertarian comics collective (which had some folks dismissing their comics as distant cousins of Atlas Shrugged) and 2) Big Head has another ongoing comic, which I must read, called Escape From Terra. So I've finally been reading Escape From Terra. Quantum Vibe may well be an individualist comic (and interviews with Bieser about Big Head would point to yes), but where Vibe is a science fiction comic with a probable libertarian bent, Terra is a anarcho-capitalist cowboy polemic set in space. Remember those old episodes of Star Trek, where the Enterprise would visit a planet that was completely populated by gangsters or Nazis or Roman gods? TV Tropes has a handy term for that, a "Planet of Hats." Well, Escape From Terra is a Future of Hats, a time when the solar system can be broken down into government fascists and benevolent frontier anarchists. It opens with two Terran agents of the United World Revenue Service, a corrupt arm of a corrupt Terran-based government. The UWRS sends Guy Caillard and Stellina Fiorella to Ceres, the dwarf planet of the asteroid belt, to bring it under the UW's heel (and bring its considerable wealth into the UW's coffers). After being feed anti-capitalist propaganda all their lives, the agents find the Belters' adamant refusal of government and emphasis on capitalist work and self-reliance has left them productive and fulfilled. Ceres is a place of no poverty and little crime. It's not your Randian Objectivist worldview, mind you. Terra is pro-religion (in fact, only it's the government stooges who hate religion) and the Belters believe in charity and at least one genius entrepreneur wants to disrupt government power by -- *gasp* -- giving away his inventions for free. There is no Dagny Taggert here talking about the morality of milking your customers for every dime. But, when it comes down to it, the Belters are each Han Solo battling the Galactic Empire. Now, there is plenty of great libertarian science fiction (my dear friend Alasdair Wilkins recently wrote a great round-up of such stories), but Terra is obsessed with patting itself on the back for its political philosophy. The anarchist characters are constantly speaking of the evils of government, and nearly every government agent is a pervert or a tax dodger. It's a shame, because this is such a missed opportunity. Terra is rollicking fun when it gets going -- as cowboy stories usually are. There are dramatic standoffs, mining disasters, space pirates who don't follow the rules of polite anarchist society. But Terra had the opportunity to contrast a vibrant anarchist society with a failing nanny state by showing the challenges and bumps in the road -- then having its intelligent, hard-working frontierspeople problem-solve their way to success. As it stands, Terra is an inversion of one of the most tedious qualities of Star Trek, where instead of being rescued by a suspiciously perfect Federation, humanity is rescued by a suspiciously perfect group of totally self-sufficient individuals. The strike against Terra as a successful science fiction story? The characters constantly reference 20th Century pop culture, to the exclusion of any other media. I mean, if nostalgia is in vogue, fine, but why is it confined to a single era? Will future peoples concoct such dull stories that everyone in human space must constantly replay Star Wars to get their kicks? Haha, my flirtations with anarcho-syndicalism ended when I started comprehending weights-and-measures, basically that we COULDN'T grow enough of anything in our few little acres to feed ourselves let alone clothe ourselves or make enough in trade goods to purchase, oh, flour. Or a car. Or much of anything. Even if we WANTED to spend all our time digging manure into unsuitable soil! But the "All our far-flung-futures' pop culture references will be the EXACT same as the author's" is an even BIGGER peeve than bad socio/economics! Why not show some creativity, folks? Here's your chance to use all those made-up band names, to insert those great historical hoaxes and Shouldabeens into the timeline!! Came from here, the Isomers available will come in different versions of ingredients, all [url=http://lfcream.com]order lifecell[/url] natural treatment. cost of lifecell It is just ridiculous where did they industry the merchandise to http://lfcream.com most fine region of pores and skin on your entire body. Creator eyewear could be the most effective exceptional design louis vuitton replica sale they usually are available diverse shapes, models plus layouts out there. The style devotees could not consider on a daily basis without the need of its creator eyewear. They can be continually hunting for cool and trendy eyewear and also named eyewear which will fit with its identity. Absolutely everyone would wish to currently have hottest eyewear so as to take a position out of your market, additionally they pick out creator eyewear. Creator dress yourself in fake louis vuitton outlet will be announced in a reduced variation and therefore people today locate them when cool and trendy plus exceptional eyewear. Most people have a preference for exclusively named eyewear because named eyewear show you a sign with deluxe plus design and style. If it’s a favorable news flash reporters, glitzy super stars and also interesting design actors, named eyewear absolutely are a design and style report to deal with. People today aim to duplicate all these super stars plus want to buy fake louis vuitton sale eyewear to search amazing plus eye-catching. There are plenty of named eyewear available for sale plus some will be Dolce & Gabbana Eyewear, Melinda Dior Reading glasses, Gucci Reading glasses, Persol Reading glasses, Versace fake chanel bags, Bvlgari Reading glasses, Prada Reading glasses and many others reliable creator eyewear out there. D&G Eyewear practice a strong urban reassurance a lot easier hot plus innovative doing your hair as compared with this with fake chanel bags extra booked biological father make. Love your art style! Thank you for sharing the comics.